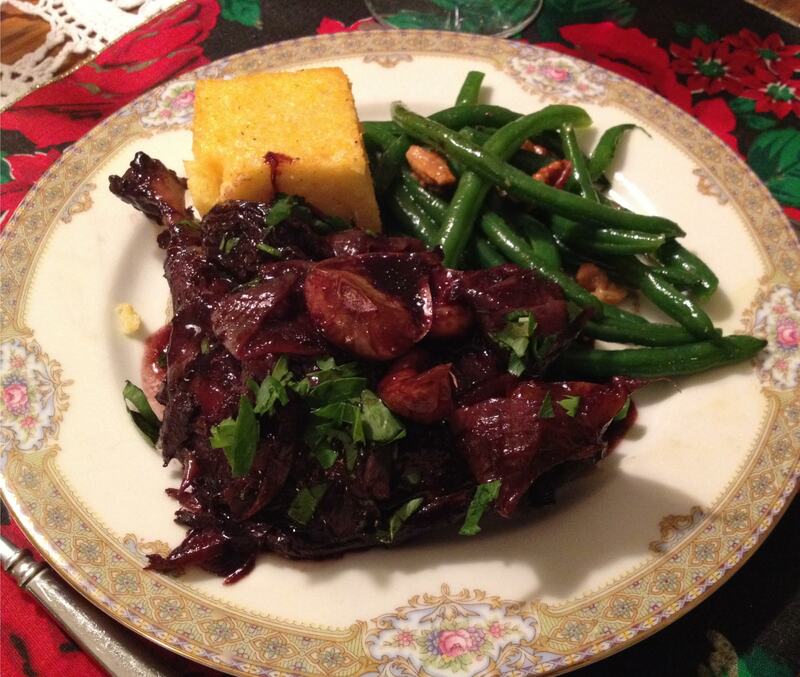 I took Judy’s advice and served it with sauteed polenta, along with some green beans tossed with olive oil and toasted walnuts. I have been wanting to tell you about this dish. 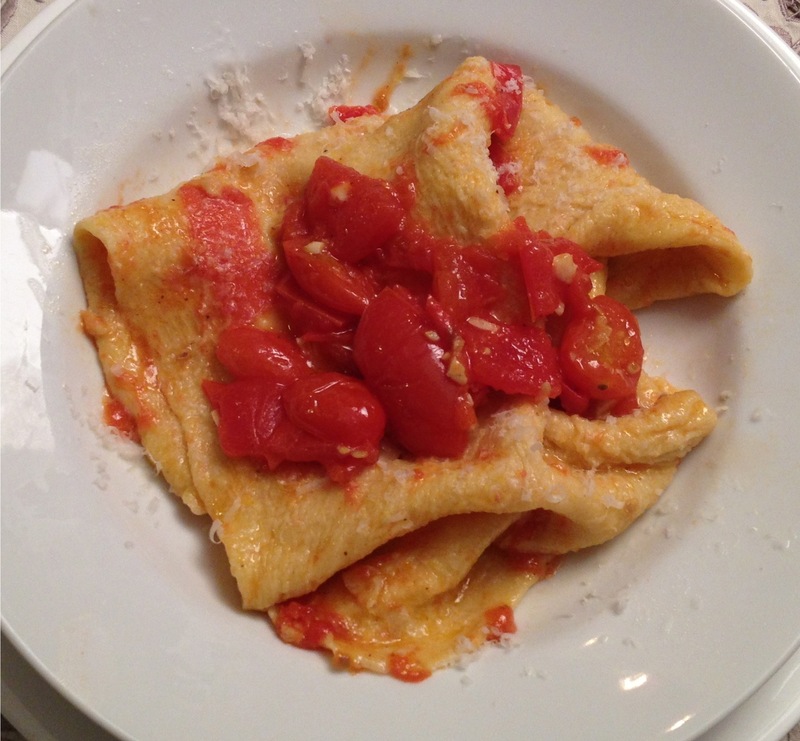 It is so delicious, silky in texture, totally yummy and best yet, it’s super easy. You just need time, so a weekend is good. 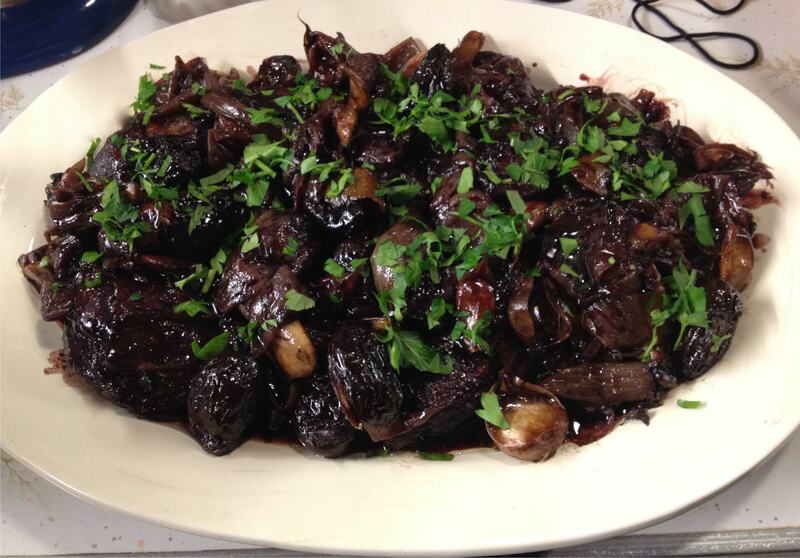 This Duck Braised with Red Wine and Prunes is a recipe from the famed Judy Rodgers, the chef and owner at Zuni Café in San Francisco. She left us way too soon, just a little over a year ago when she was only 57. 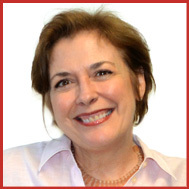 (cancer) I feel a kindred spirit with Judy. She was also from St. Louis and she loved great basic food perfected. She was known for refined simplicity. Her Zuni Café cookbook is different. Her recipes read like she is standing next to you, telling you what to expect, variations that may come up and what to do. Therefore, all recipes are very copy heavy, which is a little intimidating and time consuming to get through it all. But the upside is, she is teaching you HOW to cook, with tips all the way through on every possibility that may come up, and why, not just how to cook that particular recipe. One of my all-time favorite dishes of hers to make, and it is the most popular dish at the restaurant, is her Zuni Roast Chicken with Bread Salad. It takes an hour to order at the café, but that hasn’t put a damper on its demand. I’ll have to share that at another time. Because I love her roast chicken so much, I thought she couldn’t go wrong with duck, right? She did not disappoint. Here is her recipe. I made it with LOVE for our friends Margaret and Wayne during the holidays, using 6 duck legs and increasing the recipe proportionately, and then we got to have another dinner out of it later that week. I decided it needed a little color so I garnished it with some chopped Italian parsley. Muscovy, or Barbiere (Barbary), duck has firm, almost beefy, dark red flesh that supports long cooking and generous old-fashioned flavors. Very good with toasted polenta. Trim lumps of fat, ragged edges or meatless flaps of skin (it’s worth saving and rendering these: even a few scraps can be enough to flavor a soup). Rinse the duck legs, lay between dry towels, and press to absorb surface moisture. Season evenly all over with salt (we use a scant ¼ teaspoon sea salt per pound of duck). Cover loosely and refrigerate. Reduce the red wine and the stock separately to about 1 cup each. The stock should have body and will be slightly salty. Set aside. Press the duck between towels to wick off excess moisture. Place a dry 10- or 12-inch skillet over medium heat. When the pan is hot enough that the duck hisses on contact, add the legs, skin side down, and leave to set a golden crust, about 10 minutes. The duck will begin to render fat within a few minutes; reduce the heat if the fat starts to smoke. Turn the legs over and brown for just a few minutes on the flesh side, then arrange skin side up in an ovenproof 3-quart sauté pan. Pour off the rendered fat from the skillet; if any appetizing golden bits remain in the skillet, add the reduced red wine to the pan and simmer briefly, stirring to dissolve them. Set aside. Nestle the onion wedges in between the duck legs. Add the garlic, bay leaf, and optional orange zest and/or clove. Add enough of the reduced wine and stock, in about equal doses, to come to a depth of ½ inch; save any extra wine and stock for extending the sauce. Swirl the pan as you bring to a simmer over medium heat, then cover tightly, place in the oven, and cook for about 1 hour. Turn the duck legs over and add the unpitted prunes, making sure they are submerged in the braising liquid; work quickly, so you don’t lose too much heat. (If you are using pitted prunes, add them after 10 minutes more.) Cover the pan tightly and return to the oven. After another hour (or about 40 minutes if the duck legs are on the small end of the range listed), turn the legs over, turn the heat up to 375° and return the pan to the oven uncovered. When the legs feel just tender and are slightly browned, usually within another 20 minutes, remove the pan from the oven. 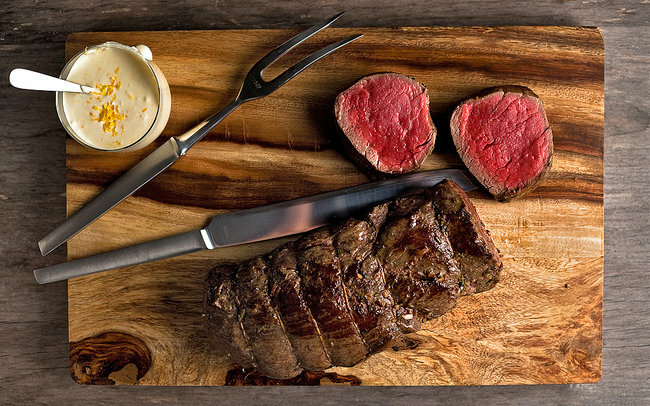 Turn off the oven and place a serving platter to warm in the oven for a minute or two. 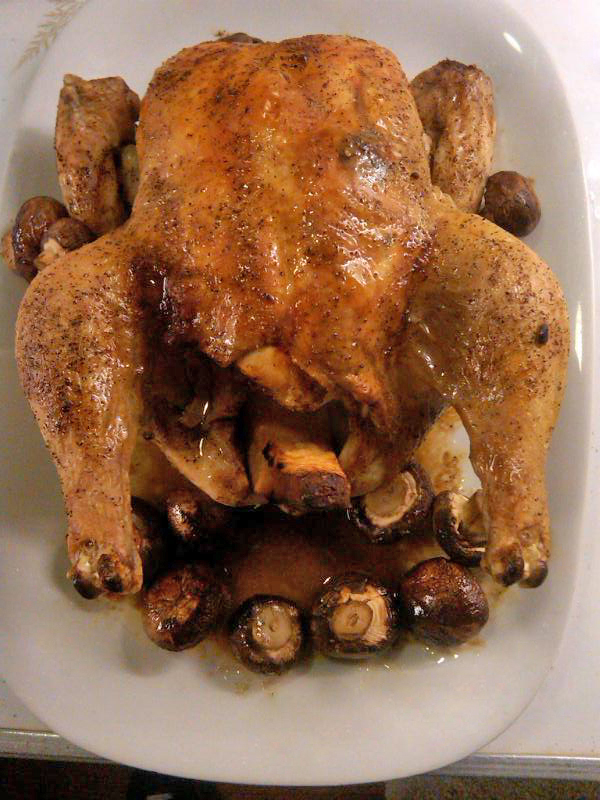 Leave the duck legs to rest for about 5 minutes, then carefully lift from the sauce to the warm serving platter. Skim the abundant fat from the surface of the braising liquid, and taste the liquid. If it seems thin in flavor or texture, set the pan over medium heat and, skimming attentively, reduce to the texture of warm maple syrup. If the sauce tastes too rich, dilute it with a trickle of water. If you seem shy on sauce and you have extra wine and reduced stock, add a little of each, then simmer to bring the sauce to a slightly syrupy consistency. 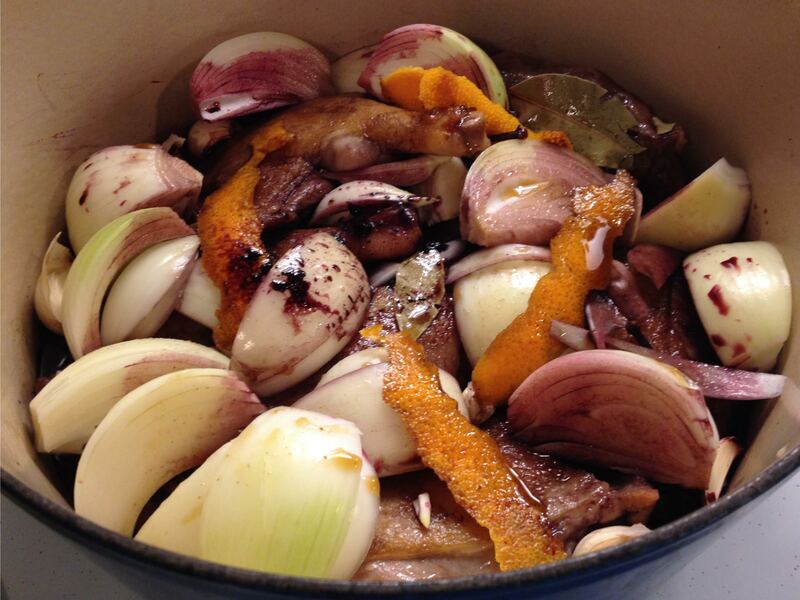 Serve each duck leg with 3 prunes and a few silky onion wedges and slippery garlic cloves. There should be a few tablespoons of sauce for each leg. I LOVE a good Caesar salad. The very best one I ever had was at Zuni Café in San Francisco. Judy Rodgers, the owner and chef there is also from my hometown of St. Louis. Her recipe from the Zuni Café cookbook is terrific, but a bit time consuming. She wants you to only use salt-packed anchovies, which are better. They are cleaner tasting, but, you have to rinse them quite a bit to get all the salt off and then fillet the little suckers. 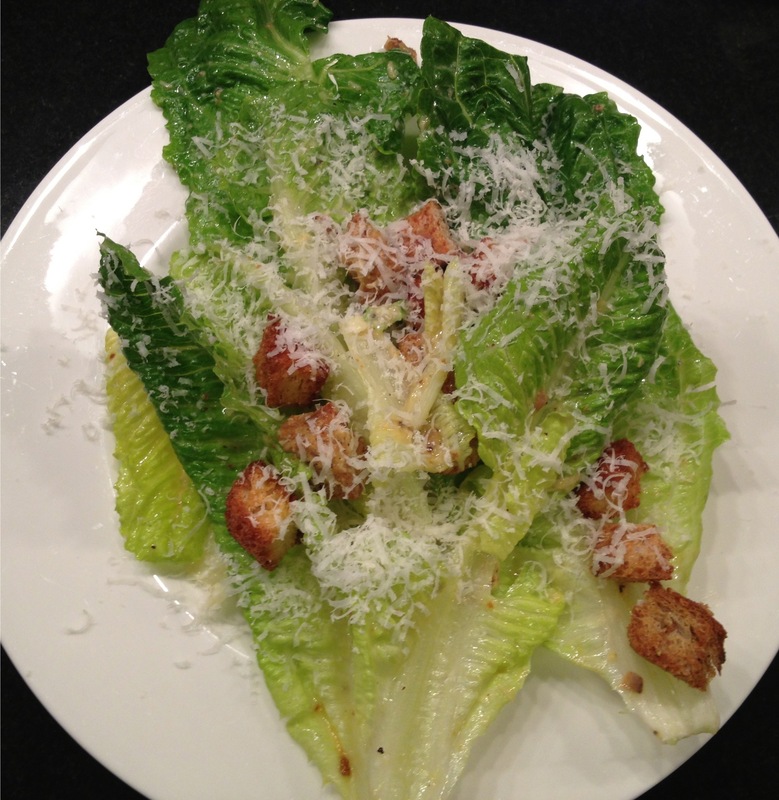 Because my husband absolutely adores Caesar salad and asks me to make it often, I have been working on a quicker version for the dressing. I believe that I am now satisfied with this one and I’m ready to share with you! But once again, it is always about the ingredients. You must use high quality extra virgin olive oil, only Parmigiano-Reggiano for cheese, super fresh lemons, farm fresh eggs (I only use eggs from our farmers, Ethel and Tom), and as Judy Rodgers says, taste it on your lettuce, and hopefully your organic romaine is sweet. Homemade croutons are a must in my book. (What else are you gonna do with all that old bread in the fridge?) Make a double amount of croutons and store them at room temperature in an airtight plastic container. They will still taste fresh for a week, so you can make another salad the following week. Your washed lettuce must be cold and dry and do not tear the leaves. Leave them whole as you can see in the photo. This is because when you tear them, they just release their water, watering down your very tasty dressing and you really don’t want that. And it’s best use your hands to toss the leaves with the dressing in order to properly coat them. Dice day-old bread (Italian, French or even whole wheat) into 3/4-inch cubes. Toss with about 2 tbs. of olive oil. Sprinkle lightly with sea salt and fresh cracked black pepper and spread out on a rimmed baking sheet. Bake approximately 10 to 15 minutes or until just golden brown. Halfway through the baking time, give the pan a shake to make sure the croutons toast evenly. Remove from oven and completely cool croutons. Store in an airtight container. In a bowl, whisk together the garlic, anchovies, and salt until blended. Whisk in the lemon juice and Worcestershire sauce. Whisk in the raw egg until the mixture is thick, approximately 1 minute. Slowly drizzle in the olive oil with one hand while vigorously whisking the mixture with the other. When the dressing is well combined, whisk in 1/4 cup of the grated Parmesan cheese. Grind fresh pepper to taste. 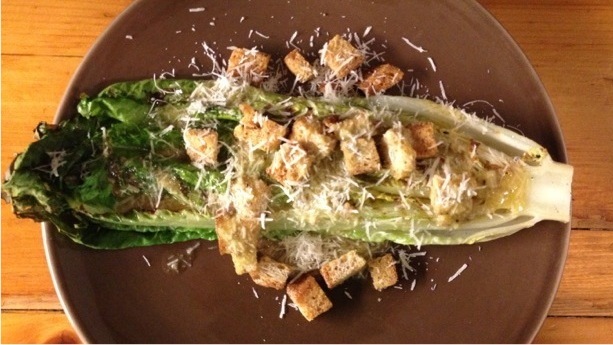 Taste your dressing on a small piece of romaine. It may need more salt, lemon juice or cheese, but remember you will grate more cheese on top before serving. I usually add more lemon juice. 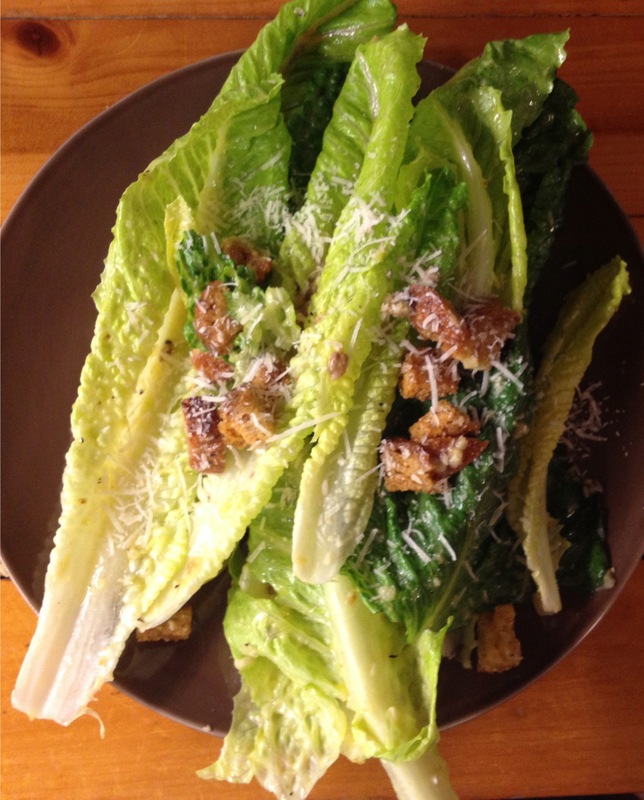 Use whole leaves of romaine hearts that have been washed, dried and chilled. Blot dry with a paper towel again before dressing. Place them in a wide bowl. Fold and toss with dressing, (using your hands is best) making sure each leaf is properly coated. Add the croutons and toss again. Arrange the leave in a single direction on the plate, scrape the last drizzle of dressing on to the salads, distribute the croutons evenly and grate more Parmesan on top. Pass the black pepper. Enjoy!! Now recently, when we’re upstate and have the outdoor grill, I have been splitting a whole head of romaine lengthwise and grilling it before drizzling on the dressing. Warm and cool, crunchy and different, even sweeter, it’s delicious!! Try it! Just brush both sides with a little olive oil before putting them on the grill. Grill the romaine 2 – 3 minutes per side at about 400 degrees on a gas grill. When done, place on a plate, cut side up and drizzle on dressing. Top with fresh grated cheese and croutons. Amazing!